something old: reminds me of granola or uhmmm remember *gorp*?? 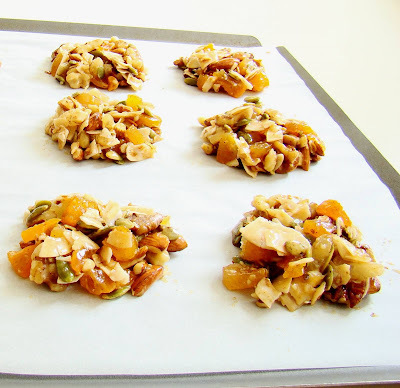 !.....something new: raw nut + fruit cookies keeps the energy up + waist line thin trim! Recipe for NO-BAKE RAW-LIKE COOKIES posted below. First off ~ I must say, I have been enjoying getting to know all of you via the blogging world! Recently ~ well I'll admit......a bit back ago I received awards from my fellow bloggers......I am filled with gratitude and so THANKFUL that you thought of me! I am sorry it's taken me awhile to post and pass on. I dedicate this post to my fellow food bloggers. Long overdue, I wanted to thank Nicole at Art and Aioli for the Blogging with Purpose Award ~ do check out her engaging site where she explores delightful + sunny approaches to her cooking that gives a sense of a personal visit every time I stop by. I love her outlook on cooking and life. She's great fun and I do love her 'art' and flow of blogging conversation. While visiting, I feel as if I want to pull a chair up, have a glass of wine and just hang out with the engaging hostess she is......! Thank you Art and Aioli! Teczcape ~ Awesome photos and outlook on world cooking. 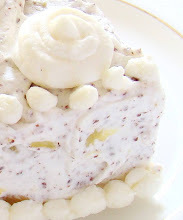 I love visiting this blog as it makes me feel like I am on a food lover's adventure. Café Chocolada ~ She bakes and makes delightful pastries, cakes, rolls, savories and mouthwatering savories as well ~ not to miss this site! My Life as Chef Erik ~ Not to miss either! 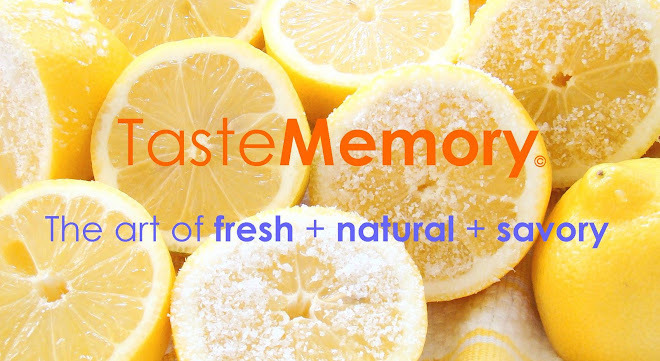 I love visiting his blog for fresh, healthy yet soul satisfying fare. A true chef at heart and by profession....he is honestly 'blogging with a purpose' with great recipes that will get your salivary glands going! So I guess to the recipients ~ do post your award on your blog and would be lovely to have a mention of moi + link back. Don't forget......pass it on! Then there is the Arte y Pico Award gifted to me from the multi~talented multi-tasking pastry enchantress Medena at Café Chocolada! Art and Aioli Nicole is also a art school trained artist and business woman ~ do check out her adventures in the kitchen, on paper and about town! My Cake Wardrobe ~ fashionista, designer and girl about town......also designer of delicious sweet cakes + delights from the inside and out. Don't miss her beautiful cakes, hand made edible flowers and other sweet tales from the big apple! Real Juice Daily ~ Oh my ~ truly inspiration in a glass! I cannot say enough about her because she has been on this incredible journey of health and realization. She has inspired me to juice and strive for balance in my love for food and healthy eating.....yet all at the same time she's stays so passionate about her quest - not to miss read! 4) Award-winner and the one who has given the prize have to show the link of "Arte y Pico" blog, so everyone will know the origin of this award. Thanks everyone and to all: Many great adventures in the world of food blogging! ***Other stuff you can add + whatever to your liking: sesame seeds, hemp seeds, flax seeds, cashews, raisins, other dried fruits, raw chocolate pieces or cacao chips, etc. ***Use unsalted nuts, preferably organic and raw when possible. Add nuts, seeds + fruits from bowl #1 to bowl #2. Combine thoroughly with a spatula. I found you have to adjust the amount of nut butter and honey to get the right consistency to get all the ingredients to somewhat 'stick' together. I add more honey to get everything binded together because I don't like the heaviness of the nut butter ~ you decide. Don't worry if the whole thing doesn't stick together immediately. You want to bind everything just enough and the refrigeration will take care of the rest. Don't forget just at least a delicate pinch of sea salt. The touch of salt with the nuts and fruit turn out quite savory. I found using an ice cream scooper effective to drop generous spoonfuls of the mixture on the lined cookie sheet. Using the scooper and fingers, nudge the fallen away pieces to clump and form the cookie shape as needed. On the bottom of my 'fridge, I found two slots to perfedtly rack up my cookie sheets! They are best when left to chill overnight and even better after 24 hours. These cookies were gone before they were ready set chilled. 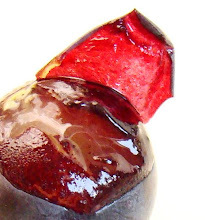 If you're desparate to begin the tasting experience, you could chill a few in the freezer for a quickie. I love this recipe and am still developing it to make it more 'transportable' yet raw. There are several versions of this recipe out there and a great one that inspired me is ShannonMarie's on We Like It Raw, an informative raw foods/lifestyles website. p.s. they must remained chilled to keep their form - taste best straight from the refrigerator. First of all, Ingar, I want to thank you so much for being so sweet and presenting me this award. You wrote such nice things about me, and I really appreciate it. There is nothing I love better than getting foodies together and creating community. So this means a lot! Secondly, HELLO, those cookie things look AMAZING! Do you have any measurements for these, or do you just wing it? Did you really cook them or leave them raw? I must know! I must have some! Thank you! It's such an honor! And congrats yourself! :) It's well deserved! You always have those types of recipes that I've seen at outside but don't' know where to even begin at home! 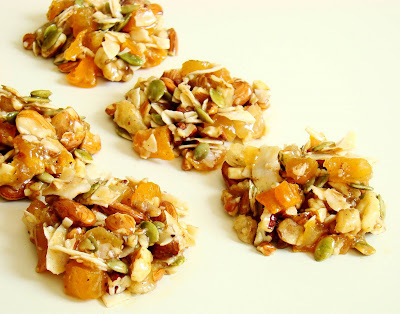 These do look wonderful and it's a healthy dessert alternative. Thank you so much. I feel so lucky to be presented with this award. It was nice of you to take the time to include me on your blog. Your cookies look great. I wish I had 10 dozen. Congrats on your awards! Those cookies--I could seriously get addicted to those! Thanks Inge - you've made my day again as you often do with your uplifting and encouraging comments. Love the raw cookie idea!!!! What an honor to be mentioned and prized with such a prestigious award! Thank you, lovely one....this truly means so much. Your raw cookies look like they are to die for. Once I get off of this juice extravaganza, I'll be needing to try those asap! Your blog is so inspirational....keep up the beautiful work!! Thanks so much for the award, I'm honored. The raw cookies look delish. I'll have to try the recipe for sure. I'm so honored! Thanks for the award! I'm learning so much and getting new inspirations from your blog too! You are welcome, and THANK YOU!!! I'll get to it when I get a chance; these raw cookies sound way better than the stuff I buy. My daughter might even like this, and it would be a great school snack. peter m ~ thanks, its a good 'in-between' healthy stuff until you want to go for the REAL fun stuff like @cakewardrobe! chef erik ~ my pleasure! elle ~ hi there, yes quite addicting esp. the pistachios + coconuts in them. nina ~ hey there, always good to hear from you.....will check out what's cooking on your side as always. penni ~ back at you! Fantastic transitions and I didn't realize the power of juicing until I kept up with your happenings. Look forward to keeping up with you at RJD! antonion ~ yeah do put the seeds + nuts you love! Flax seeds are suppose to be the best + I wanted to pick up some hemp seeds too, but it was overboard pricey at the time. Let me know how they turn out. katyk ~ hey there + my pleasure! tigerfish ~ hi + look forward to your diverse insights! medena ~ do let me know how the little one likes it - can't get mine to eat anything w. nuts+seeds! These look really cool. I would like them, since I'm a bit of a hippie. They probably give you energy, too. whoopie and aw shucks! I am ablush! Thanks for the beautiful award! It warms my heart most certainly and those raw cookies look lip smacking good. I love sticky gooey crunchy with nuts. Thanks for posting the recipe sweetie! 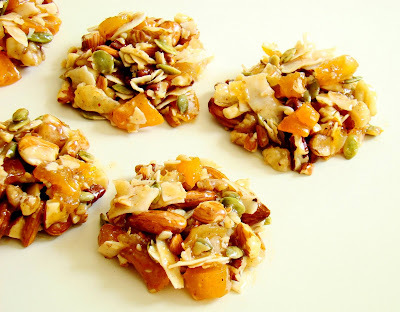 What a great twist on cookies and granola! These look like wonderful power food.. great for camping or hiking. I have a strong suspicion you are out to kill someone! In France we have someting similar on a tart called "Beggars' Tart" which is supposed to include 7 kinds of nuts. I mighthave to reconsider as I'm tempted to beg for that concoction of yours! These look absolutely wonderful! They remind me of KIND bars in their simplicity but look easy to make and more affordable than the $3 bars in the store! Thanks! These raw cookies look and sound really good! Thank you so very much! I have no words and am unable to wax poetic but feel truly honored. I will post about it as soon as I return to normal and get my life organized (somewhat) again. brentwood ~ hey + welcome! foodhoe ~ very welcome.Love your lush stuff, thanks 'bout the cookies! Hi JennDz ~ my pleasure! corinne ~ yeah, they just need the 'fridge tho, have to figure that part of it out on this recipe. kevin ~ thank you kevin! steamy kitchen ~ hello + welcome, let me know how it went! cuisine heart ~ hey there + welcome. Yeah I LOVE those KIND bars, I got this going after I had one KIND bar and it just got me going! YUMMMMMMM i want i want i want! Stumbled upon your blog by pure chance and thought that it was really beautiful...you conveyed that relaxed feeling that I always imagine to be a Californian 'thing' and the pictures were good enough to eat ! Here in Lancashire, England it's Mid-Summer now and we are enjoying all those Summery foods... lovely crispy salads and fresh fruits and vegetables.....but Winter is not far away and soon it will be Casseroles and Stews and Pies and roast cuts of meat and all things hot and steaming !